Dorothy had the Good Witch of the North to give her “magical protection from fatal harm” on her journey to the land of Oz and back. Yet she followed an uneven path, using her brain, sometimes thinking with her heart, and slowly but surely developing courage. I had my own Good Witch, Aunt Ruthie Longenecker from Pennsylvania, not Kansas. As a plain Mennonite, she never gave me glittering red shoes. I had to buy them on my own after I turned from plain to fancy. But she gave me plenty of golden advice, none more emotionally charged than the time she perceived I was veering off course at college and falling for a young man she imagined would be my downfall. The Gibson greeting card is a cute pop-up. Tell that opera singer on the top of the hill he has already sung his “swan song” and that you have decided to contribute more to this world than dishpan hands and another case for the marital appeasement courts. Think for yourself and your own future and let him produce positive evidence of his greatness. Call his bluff. – Don’t be licked. If he doesn’t understand English there’s always the possibility of a second semester transfer to Millersville, E-town or Goshen – Halloween is a good time to get rid of all ghosts and apparitions, so good luck to the Little Witch in Peachey House. At the time (my sophomore year at Eastern Mennonite College), I was trying to keep my life on track academically despite romantic upsets and did not then realize the full force of Aunt Ruthie’s words or the depth of feeling behind then. Squinting back through the telescope of years as a much older adult, I do now. In Aunt Ruthie’s day, women usually chose either the single life and a career or motherhood and maintaining a household. Hardly ever both. I was beginning to see from the models emerging in the 1960s that one could answer the call of both vocations, professional and domestic. Choices did not have to be an either-or proposition, and they didn’t have to happen simultaneously either. Did you ever benefit from unsolicited advice? What models of vocational choice made an impression on you growing up? How did these influence you? There is so much in the post, Marian. It’s making me ponder. Clearly, your Aunt Ruth did not like the young man you were seeing, and in hindsight you agree with her. I’m assuming that he believed he was going to have a brilliant career (as an opera singer? ), and that he thought you should be his wife who stayed at home? But you were interested in a teaching career at the time. My mom always worked outside of the home. My parents had their own business, and she worked there, and then after they divorced she worked at a variety of jobs until she had her own business. Actually, her mother worked, too, because her parents owned small stores in Philadelphia in the 1930s. I imagined working and someday also having a family, but the way things worked out, I ended up working from home, and I really wanted to be around for my girls. I suppose though if my college teaching career had worked out, I would have continued with that, but I would have had somewhat more flexible hours than some other working people have. It was important to me though to continue with working of some sort and to continue to be intellectually stimulated. I think my girls also benefitted from that. Ha, Merril, now I have to review the story and search for motivations, not a bad thing. The expression “opera singer” is a pejorative, just her way of putting down a young man she thought would interfere with my goal (and also her dream for me) of teaching, having a career. I assume she called me little witch because of the season, nothing more unless she assumed I had special powers to take charge of the situation – ha! Love the video and the card. 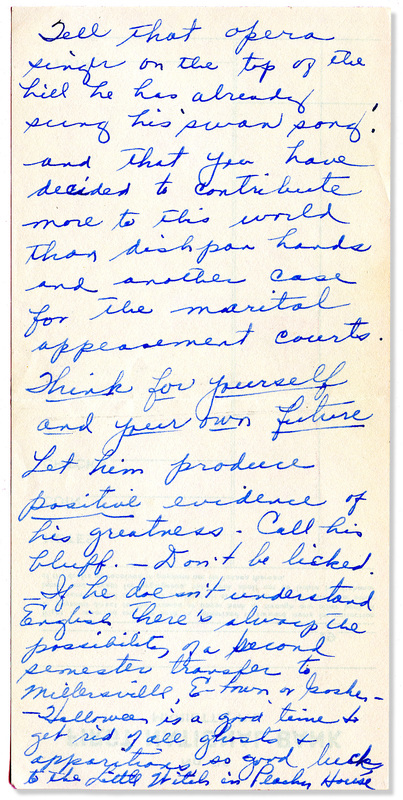 Much more the love and encouragement aunt Ruthie took to send you this advice. You have so many great memories of time so nice that you can look back at all the things you saved, and can share with us. How I learn through every post to be more intentional with my family. I try to be there for all of my family. We are many more than 100 just from my Mom. Can be crazy but very loving and fun. Thank you for your post. It shows aunt Ruthie’s great sense of humor , she is a great person. Her sense of humor is there, for sure, but also her strong feelings about not letting a young man interfere with my goals. As you say, she meant well, and I dodged a bullet, as they say! I’m sure you could picture Aunt Ruthie as you read this. And you can recognize that she meant business! Thank you, Gloria! Thanks for stirring these thoughts. Oh, the power of well-placed words. Your counselor saw more in you than you were aware of at the time and you were receptive to the question. Yes, it’s a wonderful life if exhausting at times. We’re called the sandwich generation for a reason! Great advice from your aunt. My great aunt gave good advice like that as well. She never did mince words if she thought it was for our good. Now young people would probably tell us to mind our own business! Back then, we lived in an adult-centered universe. It was a given that children would respect their elders and learn from them – at least in our family and I’ll bet in yours too! Oh, yes. And we did learn so much from them! Well, after that brush with a bad romance I concentrated more on my studies. I didn’t meet my husband until I was three years into a teaching career. By that time, Aunt Ruthie accepted me more as an adult. Besides, she liked Cliff with his artistic tendencies and love for children. I wish I could have met your Aunt Ruthie. She is such a wonderful character and I LOVE people to tell it like it is. She did have a way of doing just that. How lucky you were to have the caring family you had. Aunt Ruthie is still living but has severe memory loss. The next time I visit her, I want to share this post. She’ll laugh at her antics but will have no memory of it at all. At least, that’s what I think now. Yes, I was/am fortunate, the bitter with the sweet. Thank you, Joan. Lovely post thank you Marian! The pop up card video was funny 🙂 as was the tenderness in Aunt Ruthie’s inimitable words. I’m really stretching my memory now trying to recall if my parents or anyone else gave me unsolicited advice. I don’t think so. They probably knew I would go my own way irrespective of what they may have suggested or advised. They must have despaired at times … as I did, wondering what the future held in store. Yes, it will brighten her day. She was a feisty woman – and still is! Marian — It’s oh-so-evident that your Aunt Ruthie was a great encourager and a staunch supporter of you; wanting only what was positive, uplifting, constructive, and healing in your life. Three cheers for Aunt Ruthie! My mother answered the call of both vocations: professional and domestic. She was a stay-at-home mom until my sister and I were in high school, then LOOK OUT WORLD! Mom became the administrative assistant to the President and CEO of a large company. It wasn’t long until he realized the full value of her input and he often called upon her for unbiased opinions regarding decisions he had to make. The reason I know this is not because mom shared it with us. Rather, he was one of many who spoke at her standing-room-only memorial service and he shared that about her. “The apple didn’t fall far from the tree” is a cliche of course, but it fits so well here. In this stage of our lives, we have a chance to look back and realize the indelible etchings on our souls, minds, and spirits. I have to conclude that we don’t rise without the help of others either inside or outside of our families. Your mother was a woman to be reckoned with – and probably a kind soul too. Three cheers for your Aunt Ruthie, Marian! Who needs a Good Witch when you have such an aunt on your side? Wouldn’t you have loved to have her lecture the young man in person and advise him how to make the most of himself? A dyed-in-the-wool elementary school teacher and principal, Aunt Ruthie was known to be very direct. But had she spoken to my erstwhile romantic interest, he would know that she had his best interests at heart. From what I gather, he had a rather disappointing life, so her instincts were correct. I’m glad you enjoyed the post, Marylin. Wise words from Aunt Ruthie. You’d better believe it. Straight talk from that dear woman – always! And always nice to see you in this column, Susan! 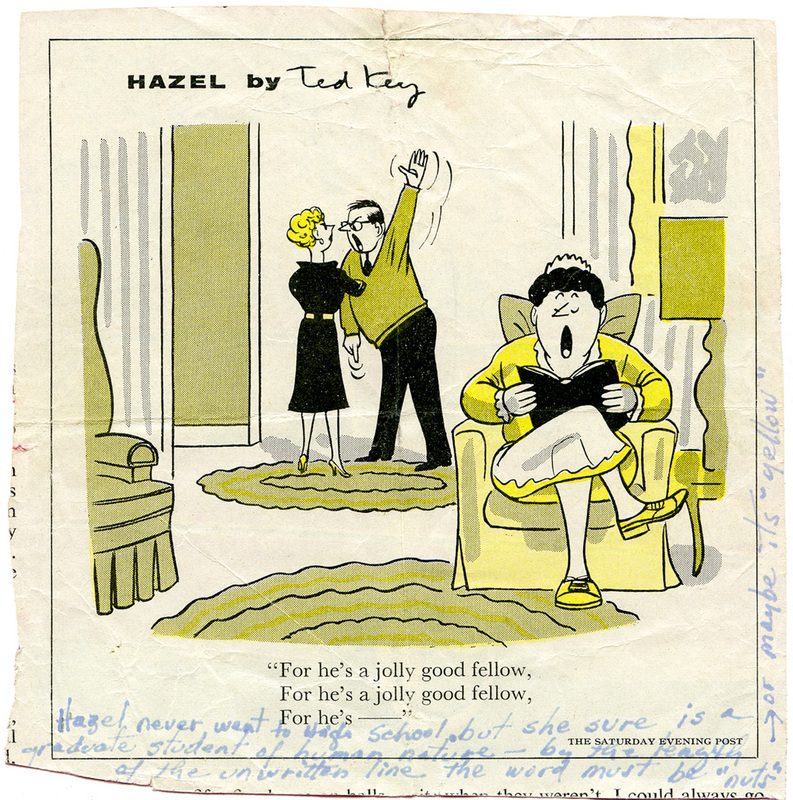 I do remember some strife in our family, but no doubt about it – we were close knit. 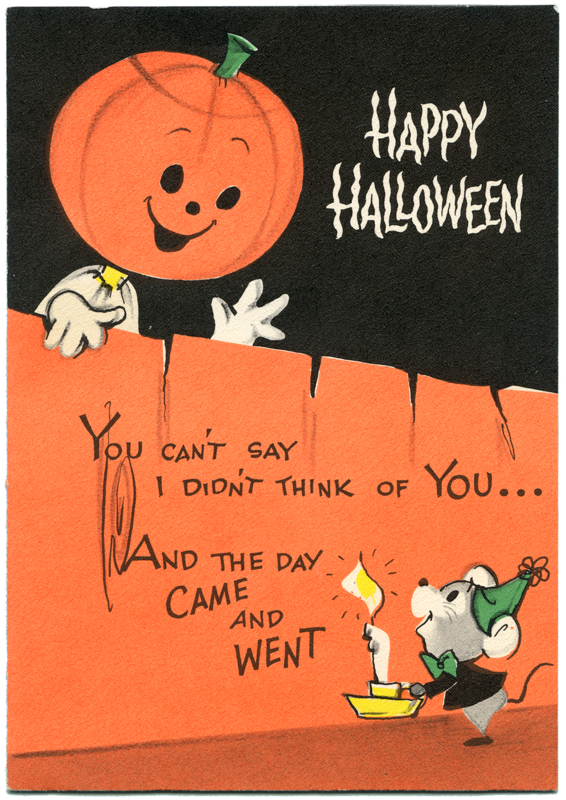 The Halloween card was a pleasant surprise tucked in with other letters in an lingerie drawer. Gotta downsize! Thank you for the assurance that I have enough memoir material. Sometimes I wonder. Now the trick is to arrange it into that magical narrative arc – ha! Your Auntie is quite a character isn’t she . I think women have always suffered for centuries . I suppose it just made them use their brains rather that their brawl didn’t it . Fortunately now we have a choice and balance has to be the key . I was having coffee in cafe the other day and I was amazed how many young men with toddlers were out enjoying the morning and their youngsters . That ‘s what I love to see and what generations of women have fought for …equality . Sometime you will have to tell the story of how you met you amazing husband. Yes, it’s good for the dads and good for the children to see male role models and neither missing out on the precious growing-up years. Thanks, Cherry! Good advice and cute cards. Actually I believe Marian’s Aunt Ruthie seemed to know that I would care and love her oldest niece but was a bit skeptical of my vocation as an artist (especially a performing artist (see YouTube – search Cliff Beaman) until…I presented a multimedia program at her (Ruthie’s) school where she was the principal. Later on Aunt Ruthie also experienced one of my chalk art programs which I presented at Christmas time at her Boosters Mennonite Church: Outgoing, outspoken young man with fancy suit, wild tie, drawing with music the Nativity scene to a quiet, unsuspecting, wondering, very plain dressed audience. Aunt Ruthie still has a sly sense of humor and was always on-the-ready if anyone looked as though they didn’t have the best interest at heart for those in her care at the time. I hope any witches who enter your life continue to be wise ones like Ruthie! Thank you – and the same to you, Rebecca. Happy Halloween! Your Aunt Ruth was one sharp lady. Beware of those who would lead you away from the path you are on. Marian … I love your analogy. “The Wizard of Oz” offers many pearls of wisdom. I have had some unsolicted advice that helped me in the long run. Often, though, it was just me leading with my ‘brain’ and not my ‘heart.’ My ‘courage’ came from my upbringing, my folks and supportive friends. I love when sparks fly. You took the idea into a wonderfully entertaining direction. As long as these pixels and electrons hold together online, both of us will have a record of facts, fantasy, and even some “inter-weavings” like these on our blogs. It’s good to know someone is watching out for you, although not always appreciated at the time I think. Mother always had lots of advice and I rarely listened to it. Had I done so she might have saved me from a disastrous first marriage. Still, we live and learn and her words have often popped into my head throughout my life. I wonder if any of mine will pop into my son’s heads in the same way? I can hear the words “live and learn” from my mother’s lips. She was always right, I have to say. Your son has a mental tape of your wise words. I have a feeling they will pop into his head at the right time. There are no guarantees though. That’s why he hope and pray. I think you are enjoying Canada now, Marie. Probably soon you’ll return to home base. Safe travels wherever you and Commando are these days. Thanks, Aunt Ruthie, for saving Marian for Cliff. Lots of souls counted on that union. She is outspoken, but with that little wink of humor. Sounds like something in you agreed with her. I’m glad you saved it. Hats off to Aunt Ruthie’s wisdom and to yours. 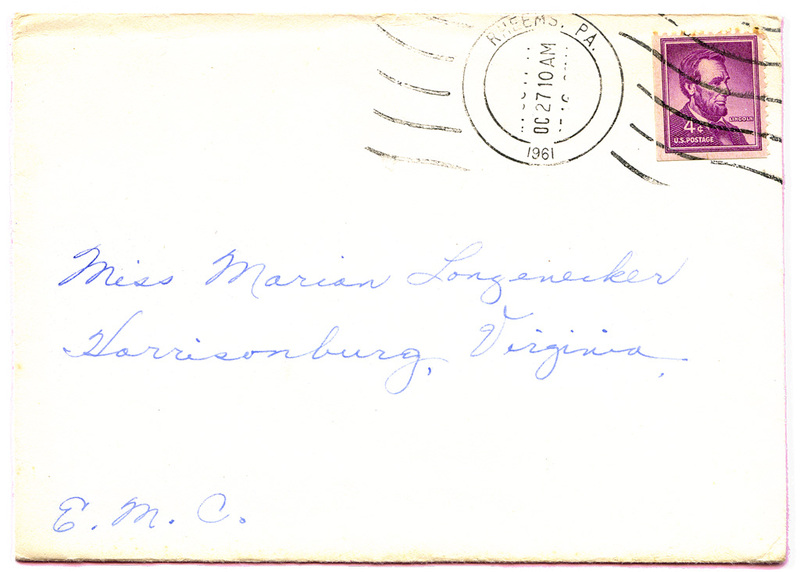 Oh, Elaine, this card/letter was wedged among others in a lingerie drawer for a long, long time. Now that I’m writing family history, I opened the envelope once again after many years and discovered its wisdom. “Lots of souls counted on that union” reminds me that I have been guided providentially by a Power higher than just my own wits. You are so kind to respond here and always with insights that others may miss. I believe you are looking forward to your brother’s visit soon. How nice that will be!